The loss of ice from Greenland doubled between 1996 and 2005, as its glaciers flowed faster into the ocean in response to a warmer climate. The results of a NASA/University of Kansas study published in the journal Science, concluded that the changes to Greenland's glaciers in the past decade are widespread, large and sustained over time. The glaciers are progressively affecting the entire Greenland ice sheet, and increasing its contribution to the rise in global sea level. Researchers Eric Rignot of NASA's Jet Propulsion Laboratory, and Pannir Kanagaratnam of the University of Kansas Center for Remote Sensing of Ice Sheets, used data from Canadian and European satellites. They conducted a nearly comprehensive survey of Greenland glacial ice discharge rates at different times during the past 10 years. "The Greenland ice sheet's contribution to sea level is an issue of considerable societal and scientific importance," Rignot said. "These findings call into question predictions of the future of Greenland in a warmer climate from computer models that do not include variations in glacier flow as a component of change. Actual changes will likely be much larger than predicted by these models." If glacier acceleration is an important factor in the evolution of the Greenland ice sheet, its contribution to sea level rise has previously been underestimated. 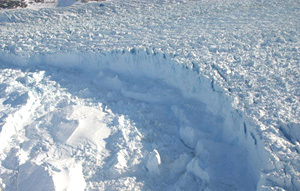 The evolution of Greenland's ice sheet is being driven by several factors, including accumulation of snow in the interior, which adds mass and lowers sea level; melting of ice along the edges, which decreases mass and raises sea level; and the flow of ice into the sea from outlet glaciers along the edges, which also decreases mass and raises sea level. This study focuses on the least well known component of change, which is glacial ice flow. Its results are combined with estimates of changes in snow accumulation and ice melt from an independent study to determine the total change in mass of the Greenland ice sheet. Rignot said this study offers a comprehensive assessment of the role of enhanced glacier flow, whereas prior studies had significant coverage gaps. Estimates of mass loss from areas without coverage relied upon models that assumed no change in ice flow rates over time. The glaciers surveyed by satellite and airborne instrument data drain a sector encompassing nearly 1.2 million square kilometers (463,000 square miles), or 75 percent of the Greenland ice sheet area. It is predicted that climate change will cause the world's two largest ice sheets that cover Antarctica and Greenland to melt before the end of this century. The world's oceans will subsequently rise 5-6 metres (16-20 feet), flooding low-lying coastal areas, many of which are heavily populated. The scientists combined ice velocity data with ice sheet thickness data from airborne measurements made between 1997 and 2005, covering almost the entire Greenland coast, to calculate volumes of ice transported to the ocean by glaciers, and how they changed with time. From 1996 to 2000, widespread glacial acceleration was found at latitudes below 66 degrees north. By 2005, acceleration extended to 70 degrees north. It is estimated that the ice mass loss resulting from enhanced glacier flow increased from 63 cubic kilometers in 1996 to 162 cu.km in 2005. Combined with the increase in ice melt and in snow accumulation over that same time period, the total ice loss from the ice sheet increased from 96 cubic kilometers in 1996 to 220 cubic kilometers in 2005. To put this into perspective, a cubic kilometer is one trillion liters (approximately 264 billion gallons of water), about a quarter more than Los Angeles uses in one year. Glacier acceleration has been the dominant mode of mass loss of the ice sheet in the last decade. 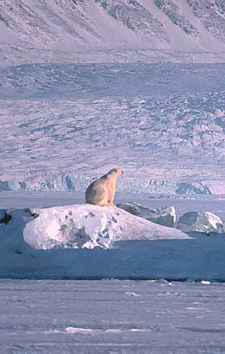 From 1996 to 2000, the largest acceleration and mass loss came from southeast Greenland. From 2000 to 2005, the trend extended to include central east and west Greenland. "In the future, as warming around Greenland progresses further north, we expect additional losses from northwest Greenland glaciers, which will then increase Greenland's contribution to sea level rise," Rignot said. Copyright © 2006 TerraNature Trust. All rights reserved.